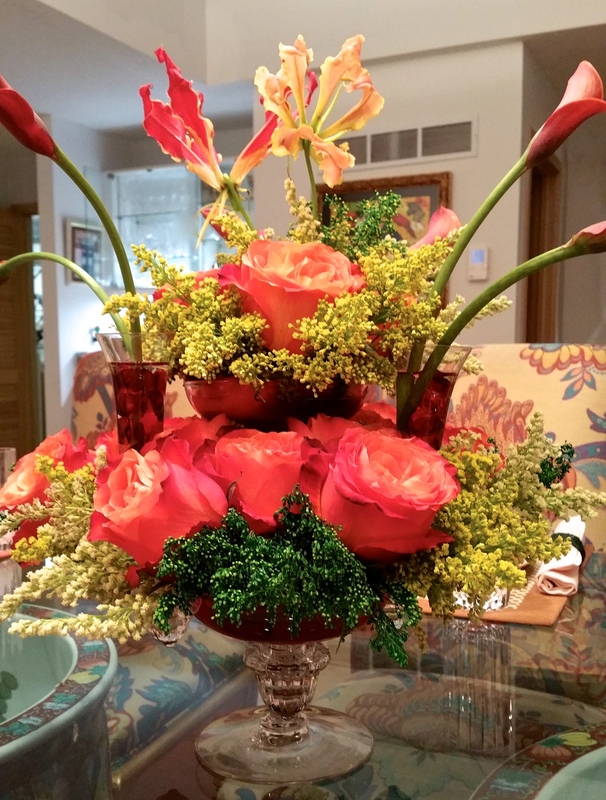 Seasonal flower arranging doesn't mean you must use the colors of the holiday. Floral design inspiration usually begins with a theme, a flower you love or a container you want to use. I want my table top designs to last for at least 5-7 days. I chose a container Chrystal I think; it's a high compote and a low compote that has multiple glass pieces arranged in a variety of ways. The bonus was, it belonged to my grandmother. I chose this container because it didn't require a ton of flowers and it wasn't so tall that I'd end up moving it all the time. The Rainbow foam, (colored foam) was part of the design so I wouldn’t have to worry about covering the foam with flowers. Rainbow foam comes in so many different colors, I used red; it's a bit hard to find, so ask your local florist. I also used standard green Oasis. I chose Gloriosa Lilies as my topper flower, because I love them and I only needed a couple to make a nice statement. I used roses that didn’t necessarily scream Christmas colors and I let the peeking red/green floral foam show a bit underneath. The Calla Lilies were a great partner for the roses. Lastly I used 3 different Solidago greens of slightly different textures and color. Always soak floral foam in water for at least a half hour; longer the better (the Rainbow foam needs more soaking then the green-Oasis). Place a few flat marbles at the bottom of the thin cylinders, then when you place the flowers (Calla Lilies) in, drop more in to help hold the flowers in place. Calla Lilies always go whichever way they choose anyway, so I let them do their thing, with a minor assist from the marbles. Place the Solidago greens in blocks of color around the base of the oasis. Cut rose stems to preferred height; most of the stems were about 2 inches. Place the Gloriosa Lilies at the top; I used a water tube since again, Lilies have a mind of their own and the water tube stuck nicely into the oasis. Most importantly, don't over think it or stress about it; have some fun with it. The Lilies go whichever way the spirit moves them, so you do the same!